Figure 9.1 Right ear. Congenital cholesteatoma seen as a white retrotympanic mass causing bulging of the posterior guadrants of the tympanic membrane. Neither drum perforation nor bony erosion are detected. Figure 9.2 Right ear. A small whitish retrotympanic mass is clearly seen. The mass lies posterior to the malleus (type A2). 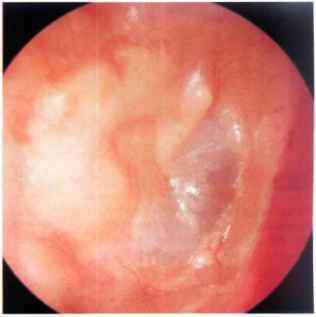 By definition, a cholesteatoma is considered congenital when the tympanic membrane is intact and there is no history of otorrhea or previous ear operations (including myringotomy or ventilation tube insertion). Figure 9.3 Left ear. A case similar to that in Figure 9.2. The cholesteatoma caused erosion of the long process of the incus with resultant conductive hearing loss. Figure 9.4 Right ear, intraoperative view. 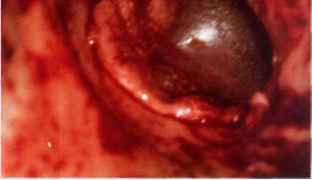 A small premalle-olar congenital cholesteatoma (type A1) can be seen behind the intact tympanic membrane. 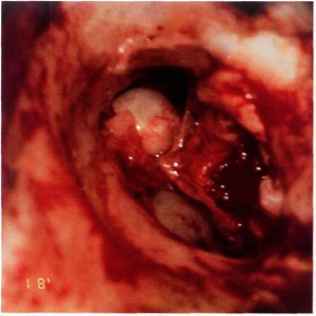 Figure 9.5 Same case, intraoperatively, after elevation of the tympanomeatal flap. Congenital cholesteatoma of the middle ear is an infrequent pathology during infancy and childhood. 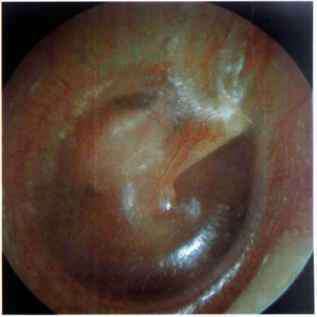 It presents behind an intact tympanic membrane, either anterior or posterior to the handle of the malleus. Anterosuperior cholesteatoma can be removed through an extended tympanotomy that permits the preservation of the tympanic membrane and ossicular chain integrity. Posterior cholesteatoma, however, requires a staged closed tympanoplasty. The second stage serves to check for any residual cholesteatoma. The ossicular chain, which is generally eroded in the posterior type, can be reconstructed at this stage. Unlike middle ear cholesteatoma, petrous bone cholesteatoma represents an epidermoid cyst that involves the petrous part of the temporal bone. This type of cholesteatoma involves and/or is related to very important structures (namely, the facial nerve, posterior labyrinth, cochlea, internal carotid artery, internal auditory canal, and posterior and middle fossa dura); therefore, the management of such lesions should be performed in centers specialized in otoneu-rology and skull base surgery. The main presenting symptom is fetid otorrhea, which frequently reoccurs in an open mastoid cavity. The second most common symptom is progressive facial nerve palsy, that occurs in more than 50% of cases. Hearing loss can be conductive, sensorineural, or mixed. 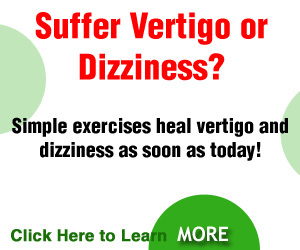 About 50% of cases complain of vertigo, but it is rarely the motive for the patient's visit to the doctor. 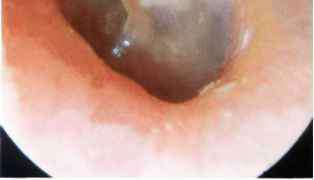 Otoscopy may be irrelevant or only demonstrates pars flaccida perforation or an open mastoid cavity with evidence of suppurative discharge. A computed tomography (CT) scan and magnetic resonance imaging (MRI) are fundamental to evaluate the extension of the lesion and to determine the surgical approach. Petrous bone cholesteatoma is defined as congenital when it develops from epithelial cell rests entrapped in the petrous bone during embryological development. In such cases, the first symptoms are facial nerve paralysis, vertigo, and deaf ear due to invasion of the facial nerve and labyrinth. This type represents about 3% of all cases of cholesteatoma and is localized at the level of the petrous apex. Petrous bone cholesteatoma is defined as acquired when a middle ear cholesteatoma follows the cell tracts of the temporal bone in a lateral to medial direction and invades the underlying structures. The most frequent symptoms in such cases are fetid otorrhea followed by hearing loss (conductive, perceptive, or mixed), facial nerve paralysis, and vertigo. The iatrogenic form also develops in an old radical cavity or as a late occurrence following tympanoplasty. 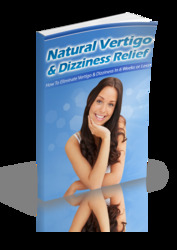 The most common symptoms in such cases are also fetid otorrhea, facial nerve paralysis, hearing loss, and vertigo. We classify petrous bone cholesteatoma into five types according to its localization and extension: supralabyrinthine, infralabyrinthine, massive labyrinthine, infralabyrinthine apical, and apical. Figure 10.1 The supralabyrinthine type of petrous bone cholesteatoma is centered on the region of the geniculate ganglion. Most frequently, it extends anteriorly towards the basal turn of the cochlea and the internal carotid artery. Less commonly, it grows towards the retrolabyrinthine air cells. This localization is typical of congenital cholesteatoma of the petrous bone. It may also arise due to a deep growth of an epitympanic cholesteatoma. 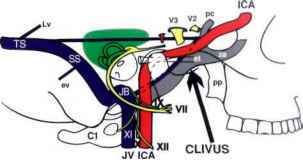 Is the tympanic membrane and the tympanic meatal flap the same thing?